In the recent years, there has been a constant debate about the kind of utilities that these LED and LCD TV brings into forth to the multiple users and their varied explorations with these gadgets. The LED TV rental Dubai have successfully able to capitalize the varied interests of the users with reference to these gadgets, in fact, in the present trend, though LED TV has emerged with certain advanced features which entice the users, they do come with an expensive price range and it sometimes becomes the roadblock to many users with reference to procuring them. Hence to, combat these inherent bottlenecks, the LED TV rental Dubai has brought in the latest variant of LED TV’s on rent; so that the users could explore the efficacies of this range of TV at the best of their varied accomplishments. LED TV has been abbreviated as the Light Emitting Diode (LED TV) and in the current context is the modified version of the Liquid Crystal Display (LCD TV). The LED TV in specific has been using the flat screen panel to display the running motion images and the most prolific differentiation between the yesteryears LCD TV has been towards the usage of the backlighting that these two ranges of TV’s bring into. The backlighting has been the most important concept which has indeed played an important role in providing the superior image quality for both LCD and LED TV. Towards this, the backlighting has been constantly evolving itself and have undergone multiple upgradations in the recent past for the range of TV’s that have hit the consumer market segment. In the earlier version of backlighting concept; LCD TV’s were instrumental in incorporating the cold cathode fluorescent lamp (CCFL) for the backlighting. LED TV’s specifically use the light emitting diode as its source of backlighting instead of CCFL’s. With the advancement of technology, the LED TV has been upgrading itself suiting to the varied user preferences and have now turned up as a sophisticated model in the present day’s context. Though the LED TV’s are the modified versions of LCD TV’s, these ranges of LCD TV’s would soon become obsolete as the user preferences are increasingly moving towards more fine tuning in the TV with reference to the system settings towards increasing the brightness at the user’s end. 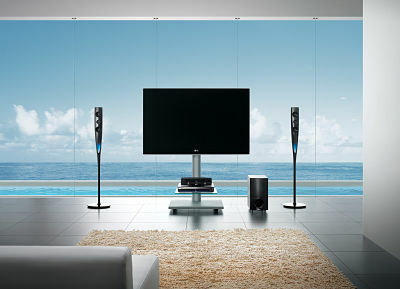 Techno Edge Systems have always been emphasized the LED TV’s towards the home segment users and have constantly brought in most advanced LED TV’s for the users so that they could explore the finest motion picture experience at an affordable price range. In the event that you are looking for LED TV rental for your home viewing, please approach us at Techno Edge Systems and call us at +971-54-4653108 so that our technical team could assist you with your desired objective. Please visit our official website at www.laptoprentaluae.com for more information.